A unique sibbing of two forms of Phal. 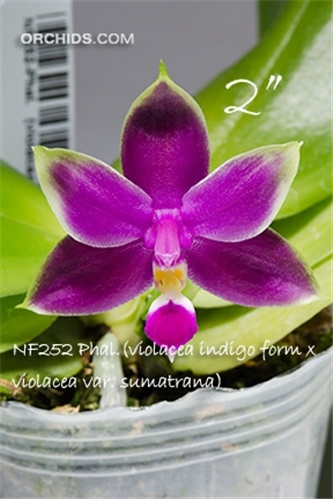 violacea with the advantage of stronger growth than is often the case with the indigo form of Phal. violacea. As a seedling population, not a mericlone, some will flower like the indigo form but the majority will most likely carry the deep purple color from Phal. violacea var. sumatrana. We have yet to see the resulting progeny and cannot guarantee which parent the flowers will reflect - a great reason to flower more than just one !